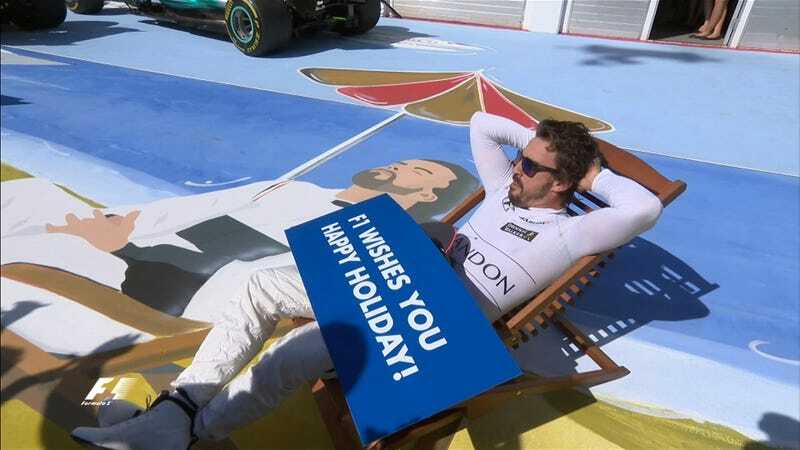 Fernando Alonso isn’t quite living his best life, but he did have his best finish of the season so far at today’s Formula One Hungarian Grand Prix, clinching the fastest lap of the race and embracing his iconic meme. It was Alonso’s birthday yesterday, and today he wasn’t gifted with a win, but his Honda-powered McLaren didn’t give up on him which is about as much as he could have asked for at this point. Sebastian Vettel won the Hungarian Grand Prix today to hold his place as points leader, but Alonso finished P6 with the fastest lap of the race, setting a 1:20:182 lap time—a little surprising probably even to him. Looks like a good, refreshing finish for Alonso heading into the summer break. Enjoy the time to experience as many places you’d rather be as possible.